With a Q : Graduated! Woo-hoo! Well, I finally graduated from my Masters program in Education, via CTER at the University of Illinois, Urbana-Champaign. Forever an Illini now! 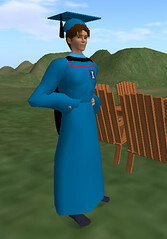 I was a little disappointed that I couldn't make it into Illinois for my real-life graduation, but I decided to get dressed up anyway in OpenSim to celebrate. Make sure to check out my final project, the Fashion History Holodeck! So now what? Not sure yet. I plan to relax, carry on what I learned at school and apply it in my 9-5 job, I really want to get OpenSim up and running there so I can really have some fun with it. But for now I want to spend time enjoying myself: maybe pick up the guitar again, learn ukelele, migrate this blog over to WordPress, and take care of everything I have been neglecting for the last two years, i.e. go to the gym more. Start early in the week! If you have reading assignments, do them early so you aren't jamming through them when assignments come due. If there are discussion forums, be one of the first to post up there so the rest of the students in your class can reply to them and you have more material to continue the conversation. This is especially true if you are mandated to reply to your classmates' postings. Get to bed at a reasonable hour, or else the rest of your life will fall apart. Even if you schedule yourself wisely with assignments, make sure to sleep well and get to work refreshed, it helps everything else fall into place. Go the extra effort with group projects and fit in time to coordinate with your peers. If you live in another state, reach out first and let everyone know your are there. Pick a good system like a free PBWiki or Google Group to communicate and archive your conversations. Don't let your personal life slip through the cracks. You will go crazy at times, but learn to take a day and cut loose a little bit, your friends and family will thank you. Anyway, hope this helps. Check out my final project, the Fashion History Holodeck below! Posted by snaggle on Sunday, May 24, 2009, at 2:59 pm. Filed under 95. Tagged cter, ed-tech, instructional video, opensim, second life, vle. Follow any responses to this post with its comments RSS feed. You can post a comment, but trackbacks are closed.